File synchronization tools ensure that you don’t have to worry about keeping track of deleted files or the new files that need to be backed up. 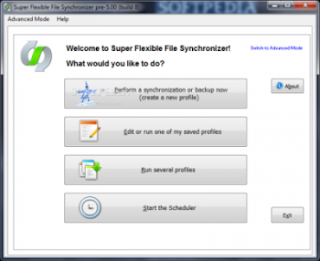 Super Flexible File Synchronizer is a powerful fi le syncing tool that can synchronize data between two folders/ drives or FTP location. The software starts in Wizard mode, which walks you through the process of setting up the synch profile. You have to specify the source and destination locations, set the direction of synchronization and schedule.